The South Korean government will work towards inviting its Chinese and Japanese counterparts to jointly combat fine dust pollution through agreed multinational framework and timeline. The Ministry of Environment announced on Monday it has embarked on the process of drawing up a phased roadmap to seek inter-government commitment to fight the regional air pollution problem. It will hold multiple hearings to map out a persuasive and detailed outline that other governments can agree to. Last month, a Korean government study showed the worst wave of fine dust that hit the Korean peninsula in January came mostly from overseas regions including China. 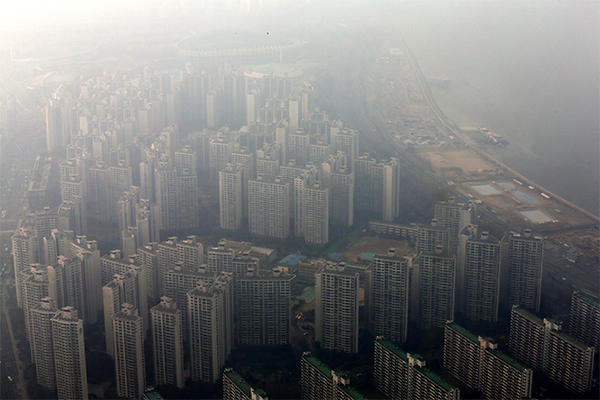 Other studies and satellite pictures have also shown that ultrafine dust from overseas has been partly blamed for the highly concentrated fine dust that has frequently covered Korea. But China has been refuting such arguments. The agreement could stipulate the obligation of each country to reduce fine dust and country-specific targets for fine dust reduction. In addition, the government decided to jointly evaluate the progress in the implementation of the agreement and to create a joint project in reducing fine dust. The agreement is inspired by the Convention on Long-Range Transboundary Air Pollution (CLRTAP) in Europe and the Air Quality Agreement (AQA) signed between the U.S. and Canada, according to the Korean government. The European CLRTAP signed by 31 of the 34 member countries of the UN Economic Commission for Europe (UNECE) in November 1979 aims to collect and exchange information on the movement of pollutants, air pollution management strategies and emission reduction technologies in each country. The AQA, which came into effect in 1991, has mandatory regulations for the reduction of sulfur dioxides and nitrogen oxides and other air pollutants, and requires a performance report every two years.